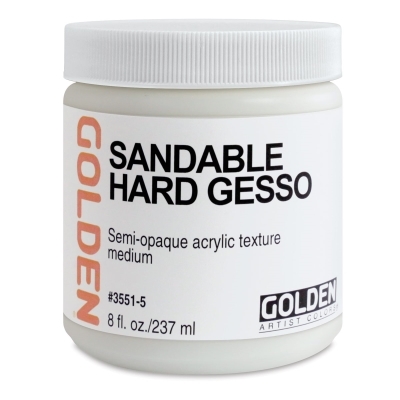 Golden Sandable Hard Gesso is formulated with 100% acrylic dispersion polymer. 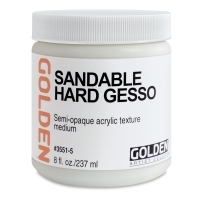 It can be sanded to provide surfaces that are smoother and more even than those created using regular gesso. Containing high levels of titanium dioxide, calcium carbonate, and talc, Sandable Hard Gesso is easier to sand and smoother when finished than many other gessoes. 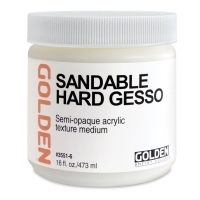 In addition, it is slightly more absorbent than regular Golden gesso. It should only be used on rigid supports due to a tendency to crack when flexed, but can be sanded to a highly polished surface.